2. 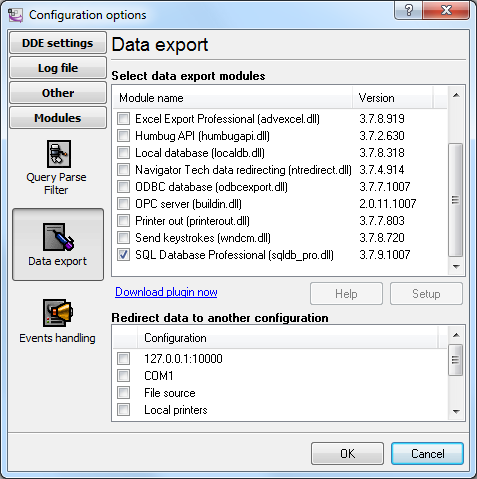 If it is an SQLBase, Oracle, SQLServer, Sybase, DB2, Informix, Interbase, Firebird, MySQL or PostgreSQL database, you can use the "SQL Database Pro" data export plug-in (fig.1) instead of the "ODBC database" plug-in. You should download and install this plug-in separately after you install the program. In this case, you also add DDE items and select the parser, but you configure the "SQL Database Pro" plug-in instead of the "ODBC database" plug-in the way it is described in the manual on our website.